Like Canada’s population, its Australian Football sides (past and present) are spread out in three areas, Southwestern British Columbia, the Edmonton-Calgary corridor and between Windsor and Quebec, where the majority of Canadians reside. The new Ottawa Swans side is trying to expand on the latter and so far are having a great deal of success. Ottawa is Canada’s capital and combined with outlying areas in both Ontario and Quebec, the National Capital Region is home to 1.1 million people. The new side is the work of two people, and follows the model of most fledgling clubs in Canada, with a Canadian and an Australian working in Canada. The Canadian is Roman Dzioba, who became acquainted with the code in Australia and approached the Ontario AFL last year looking to get the side started. The Australian is Steve Spurrell, who started out with Mount Evelyn in the Yarra Valley Mountain District FL in Victoria (Australia) and made his way to Ottawa with a stop in Calgary with the Kangaroos. The side put up its website at ottawaswans.com in mid-December, and it’s been all up from there, with a side large enough to qualify for the OAFL. As per normal, the "easy parts" have been easy for Ottawa, such as getting help from other clubs through Gareth Williams of the Kangaroos and a friend of new-found footy clubs across Canada, Bruce Parker of the Central Blues and AFL Canada. The Swans also got some help from the Australian Embasssy (the advantage of being in the capital). The Swans' website has helped tremendously, with an online sign-up making it simple. Add free newspaper ads and lower-tech methods like word of mouth and Ottawa has a solid player base, with the OAFL being the goal, and a season of 4-5 matches with a possible tournament in Ottawa being plan B. The harder challenges have been the same as across the whole world, for example, explaining that Aussie Rules is not Rugby, Union or otherwise. Also, making people feel like there’s no obligation to come try footy is difficult, as in Canada, people used to paying thousands of dollars a year to play hockey feel there must be a financial catch. Another Canadian problem is travel, as Canada is even larger than the United States, with cities being spread farther apart. Ottawa is the furthest side from another club, but the plan to get around that is for the teams coming up from the Toronto area to meet Ottawa coming down on occasion, in somewhere like Kingston, a fair-sized city in its own right. A similar system works well with the Seattle Grizzlies and Portland Power meeting in Olympia and should ease the travel burden for the Toronto sides (although a trip to Ottawa in the middle of summer is hardly a burden). The Ottawa side is flourishing, with the season still months away. Hopefully the lessons learned in Ottawa will serve AFL Canada well in an attempt to add one of the remaining seven provinces to Canada’s footy map. 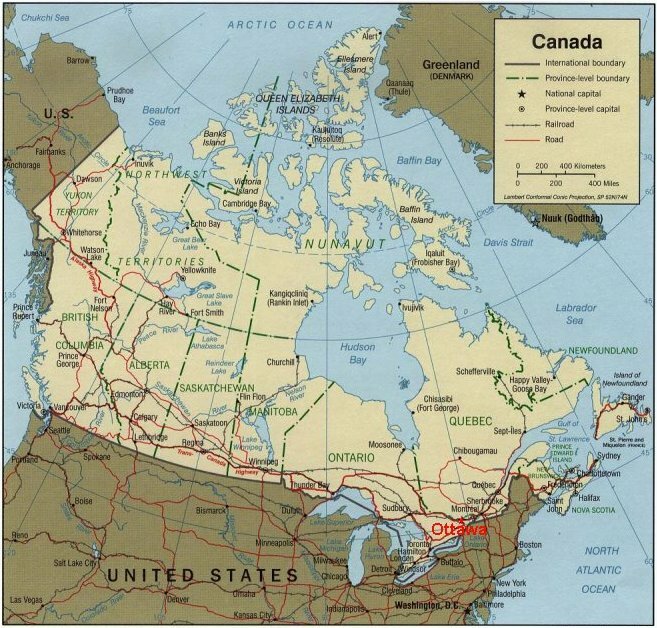 Ottawa lies towards the southeast corner of Canada, next to Australian Football's main playerbase in the country, the province of Ontario (centred in Toronto). The other major footy areas are Vancouver in British Columbia on the west coast, and further inland at Calgary. The first tentative steps are also being taken in Winnipeg, Manitoba.